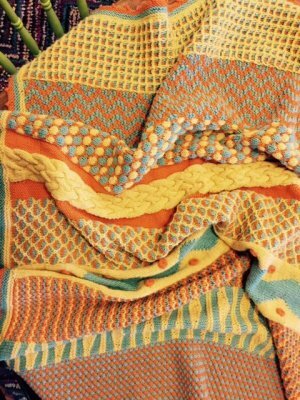 Whether you choose to knit a baby blanket (21 in. x 26 in.) or a throw (36 in. x 51 in. ), you will learn color work to please, challenge, and inspire you. 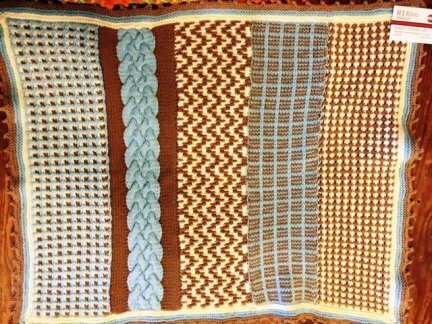 A 5-session, 5 month class to cover 5 beautiful knitted panels using 3 of Simplicity’s vibrant colors of your choosing. A 10-session, 10-month class to cover 10 beautiful panels using 3 of Simplicity’s vibrant colors of your choosing. Both classes include a full-color instruction and pattern booklet that includes video links for support between classes. Classes to be taught on the first Thursday of each month beginning in May 2016 -- May 5 , June 2 , July 7, August 4 , September 1 , October 6 (make-up class and end of 5-session course), November 3, December 1, January 5 , February 2, March 2, April 6 (make-up class and end of 10-session course). Stop by the shop to save a spot and choose your colors.